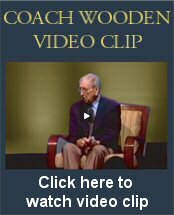 Coach Wooden established four essential components of being a successful coach: The coach as a Philosopher, as an Example, as a Teacher, and as a Leader. The primary sources of the early formation of his philosophy were the rules (The Two Sets of Three) and the advice (The Seven Point Creed) that he received from his father. Utilizing this philosophy along with his early challenges as a coach and teacher, Coach was able to define his concept of true success. For achieving success, as he defined it, Coach established the most desirable character traits one must possess –the same traits that molded his style as a teacher and a leader – within the blocks and mortar of his Pyramid of Success. 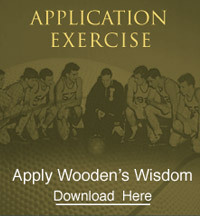 Hence, while Coach Wooden is most famous for his Pyramid of Success, in order to properly understand the philosophy upon which the Pyramid was constructed, one must first have a basic understanding of the “Two Sets of Three” and the “Seven Point Creed.” Thus, in order to lay the proper foundation, it is here at the beginning where we will begin our series of weekly coaching modules. These rules are simple and self-explanatory, yet they are as important as they are obvious. The first thing anybody wants to know about you is, “can I trust you?” It is a question asked by parents, friends, co-workers, recruits, athletic directors, fellow coaches and anyone else with whom you may hope to build a relationship. By following these three simple rules consistently, you will always be trustworthy. Coach Wooden’s players and those he worked with over the years always talk about the good example he set. His coworkers have told many stories about this, such as the payment he made to cover some personal phone calls he had placed over a school phone, even though they totaled less than a dollar. One of his fellow coaches speaks of the fact that after Coach Wooden retired and maintained an office in the athletic department, he would still take all of his return correspondence and packages to the post office himself each day and pay for the postage out of his own pocket. Indeed, his integrity was legendary. The true athlete should have character, not be a character. And of course, Coach always gives a character trait (a block on the pyramid) to remind us of these behaviors. In this case it is Loyalty – “To yourself and to all those depending upon you. Keep your self-respect.” Coach Wooden has often described Loyalty as an essential component of any successful team. However, loyalty can only be built if you have integrity, so be certain to start there first.